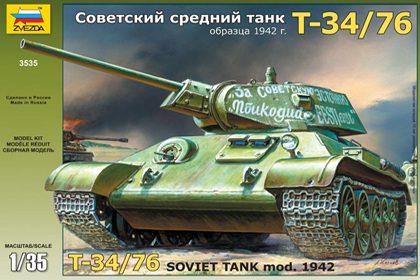 This is the Zvezda 3535 kit in 1/35 scale, of the ‘Russian Tank T-34/76’. The T-34 had well-sloped armour, a relatively powerful engine, and wide tracks. The initial T-34 version had a powerful 76.2mm gun, and is often called the T-34/76. The T-34/76, like many other contemporary tanks, had a two-man turret crew arrangement. This required the tank commander to aim and fire the gun while having to coordinate with other tanks and potentially also being a platoon commander, and proved to be inferior to the three-man (commander, gunner, and loader) turret crews of German Panzer III and Panzer IV tanks, which allowed the tank’s commander to concentrate solely on that job. This entry was posted in Kits, Stash and tagged 1/35, 3535, medium tank, russian, t-34, t-34/76, zvezda by Thomas. Bookmark the permalink.